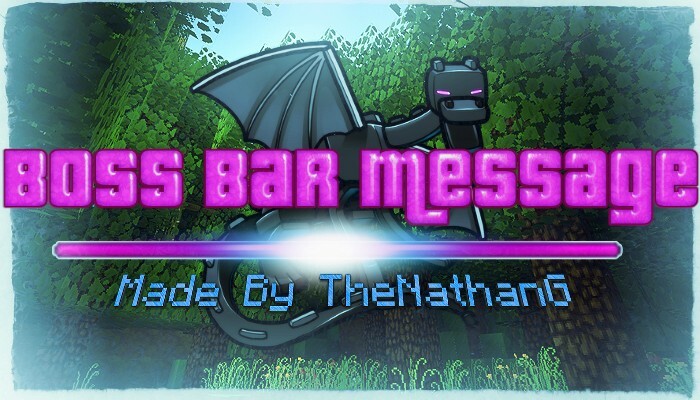 Boss Bar Message provides an easy to understand way of sending messages to players via the boss bar. Administrators can communicate alerts and messages to players in an unobtrusive manner, keeping the chat free for player messages. Here are a few examples of what a Boss Bar Message could look like. As you can see, Boss Bar Message provides a very lightweight way of communicating with players. Color and formatting codes are usable in any message! Custom bar color and type for each message. Custom time length for each message. Player-specific (private message) sending functionality. No visible withers or ender dragons! If you have any suggestions for the plugin, please let me know them! I would love to make this plugin better by implementing your ideas! If you are having an issue with the plugin, please submit a ticket. Do not post your problem in the comments, it will not be replied to! This plugin uses the bStats metrics system. To disable metrics, simply set enabled to false in the config.yml file located in the bStats plugin folder. Animated messages in the boss bar! Only messages to users with a specific permission. Plugin Dont work at all, 0 STARS!!! NOT RECOMMENED! Does it support multiple lines? I want it has 3 lines in a boss bar. great plugin, would you be able to add so even players who log in after you typed the command can see the boss bar? How do i make it so it automatically does different ones. There's currently no way to do this within the plugin. Hiya everyone! Posting this to say that the comments below this comment are from the pre-reboot version of the plugin and do not reflect it in it's current form. I don't think so. It doesn't work for me. I this plug in going to updated to 1.9? or 1.10? Is there a way to bind a boss bar locally to a block, say a beacon? So that local areas can have their own message, without withers? Please read the description of the plugin! Is there a way to output the players name? I'm using Spigot 1.8.7 with BarAPI. u need http://dev.bukkit.org/bukkit-plugins/bar-api/ for it to work, i had same problem and then saw console.